I got interested in food somewhere in the early- to mid- nineties. I’d just graduated from University, and finally had a job and a place of my own. I had a fiance and, later, husband. I was an adult. I had a very close-knit group of friends in Corner Brook, Newfoundland, primarily tied to the theatre community there, but one day, someone new was introduced to our circle. Don Genova was a food journalist from Toronto, working at the CBC. His wife worked with my friend, Mike, at the country radio station in town, and Don was, and still is, a dedicated foodie. My first taste of curry was one he cooked, my first bite of sushi also was with him. He introduced me to a world that I didn’t know existed (because it didn’t in Corner Brook, Newfoundland!). We literally had one gourmet specialty food store in our hamlet of 24,000, and I started to spend a lot of time there. Garam Masala! Miso paste! Kumquats! In February of 1995, we flew out to Vancouver to visit my family. I had been cooking more and more with fresh herbs, experimenting with growing them in the tough, rocky, Newfoundland soil. My parents were living in Richmond, so I went to the Landsdowne House of Knives, and purchased my very first chef knife. It’s a Victorinox (they’re the people that make Swiss Army Knives), and at the time it cost me $40, which seemed like a huge investment. But I love that knife. I have used it pretty much every single day of my life since I bought it. It has the perfect rock for mincing herbs and garlic, I can chop an onion with it in seconds flat, and it’s not too heavy if I’m doing a lot of chopping. Its long-time companion has been an $8 wooden Ikea cutting board that I have taken careful care of, making sure I oil it after it comes out of the dishwasher. I have a sharpener, but every year or so, I take it back to the House of Knives to get a professional sharpening. 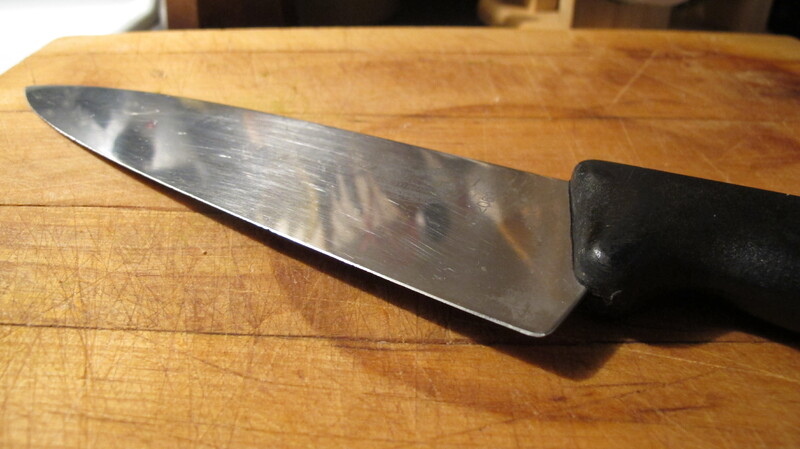 The least you can do for the tool that you use the most in the kitchen, your workhorse. I gotta say that the two knives I have are my favourite tool in the kitchen. (Like what Giada uses on her show). Runner-up is the corkscrew – cannot live without one, (or two or three). Nothin’ fancy, just functional! Great post Rebecca and thanks for sharing. PS: Just for the record I did not get my knives because Giada uses the same kind of knife. When I bought them I did not even know who Giada is/was!